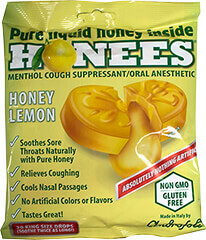 Honees Menthol Cough Drops have a honey and eucalyptus hard candy shell filled with liquid honey and eucalyptus. Long before cough-drops were marketed as ""natural"" people reached for a Honees drop to soothe sore throats. Each bag contains 20 individually wrapped Honees Cough Drops. Loratadine 10 mg is manufactured by Health Star.